Born in Pisa, Italy, on February 15, 1564, Galileo was the son of a talented and well­ respected musician. At 17 he enrolled at the University of Pisa to study medicine but soon took a greater interest in mathematics and physics. One day during a service in the Pisa cathedral he used his pulse to show that the time it took the great chandeliers hanging from the ceiling to swing back and forth was always the same. His careful experiments with pendulums of lead pellets attached to strings confirmed that the time it takes an ideal pendulum to swing depends on its length, not on its mass or the size of the arc through which it moves. By age 25 he was appointed to a mathematics professorship at Pisa. At about that time he began experiments to refute the work of Aristotle, the ancient Greek philosopher whose ideas still influenced science in Galileo’s time. Aristotle wrote that objects fall because their natural place is in the Earth, and the heavier they were, the faster they would fall. Galileo realized that anything he dropped would fall too quickly to measure, so he conducted his experiments by rolling balls down long, gently sloping ramps. He reasoned, correctly, that the ramp would offset the effects of gravity without changing the overall result. He was not surprised to find that lightweight balls rolled just as fast as heavy ones. His greatest discovery, he felt, was that however far any ball rolled in one second, it would move three times farther in the next second, five times farther in the next, and so on. He was the first to prove that objects accelerate as they fall. By 1609 he was ready to publish his results on motion when his work was interrupted: a Dutch optician had combined two lenses in a way that made distant objects appear larger. Galileo quickly improved the design and apparently was the first to turn his telescope to the night sky. Everywhere he looked he saw thousands of stars that no one had ever seen before. “But the greatest marvel of all,” he wrote in The Starry Messenger in 1610, “is the discovery of four new planets. I have observed that they move around the Sun.” He was referring to four large moons that orbit Jupiter (now called the Galilean moons), which he discovered in 1610. His observations convinced him that COPERNICUS’s Sun­centered vision of the solar system was correct, that the Earth was another planet in motion around the Sun. His conclusions conflicted with the official view supported by the Roman Catholic Church, and in 1616 Galileo was forbidden to teach or promote the Copernican theory. In 1632 he broke his silence and published a book discussing the two conflicting theories of the solar system, for which he was punished by house arrest in 1633 until his death. In 1638 Galileo smuggled out of the house the manuscript for a new book on the mechanics of motion, summarising his work from before 1609 and after his arrest. In it he described his discovery of the constancy of pendulum motion and claimed, for the first time, that moving objects tend to keep moving unless an outside force acts on them. 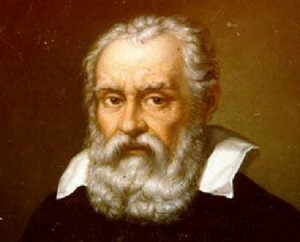 Galileo died on January 8, 1642, in Artreci, Italy. Galileo’s legacy extends beyond his great discoveries. He changed forever the way science is practiced. Until his time natural philosophers focused on why things happen. Instead Galileo considered how things happen. He strove to uncover the simple patterns that describe the motion of falling objects. Ever since Galileo, scientists have separated “how” from “why,” making hypotheses to explain why something happens after they can accurately describe how it happens. Galileo’s work on the mechanics of motion was taken up after his death by the Dutch mathematician CHRISTIAAN HUYGENS. Improving and refining Galileo’s work, Huygens developed the first practical pendulum clock in 1659. Galileo’s conclusion regarding the tendency of objects to keep moving unless altered by an outside force came to be known as the law of inertia, and was adopted by Isaac NEWTON as the first law of motion and incorporated into his comprehensive theory of motion outlined in Mathematical Principles of Natural Philosophy (1687), also known as the Principia. Galileo was the first scientist to realize the value of abstracting from nature to the laboratory. Aristotle and all others before Galileo insisted on studying falling motion by looking at actual objects in nature, such as leaves and snowflakes. Galileo’s genius was to realize that those motions are complicated and altered by friction, and that more would be learned about the essential process by working in the lab to reduce the effects of friction. Posted on March 7, 2015 by Natalie. This entry was posted in Astronomers. Bookmark the permalink.